At Citizens Online, we use the term ‘Digital Champion’ to refer to people who help others understand the benefits of using the internet and can show them how to do simple things online. We believe Digital Champions can make a huge difference to people’s lives. We advocate for the use of different types of Digital Champion (DC) to help tackle digital exclusion. This case study looks at a ‘professional Digital Champion’ – someone employed within an organisation (in this case directly by Citizens Online) specifically to work across a community to increase digital inclusion. Citizens Online also believes that Basic Digital Skills, digital literacy and digital inclusion can, and should, be incorporated into a professional role and that there is a skills and employment path for Digital Champions in the UK. This customer-facing job is a great step on from volunteering; doesn’t require technical-level qualifications or skills; and has transferable skills that can be a great stepping stone to other employment. 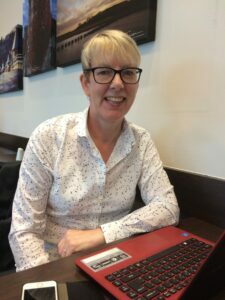 Rachel Martin has been working as a professional Digital Champion for Citizens Online as part of the Digital Gwynedd project since July 2017, working 18 hours a week – as well as 14 hours a week for the Gwynedd Council Libraries service. Rachel has a 16 year old son, and prior to joining Citizens Online had been working in Libraries for a decade. 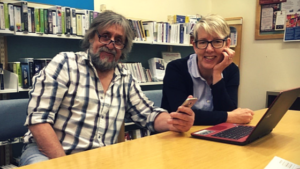 She spends most of her time as a Digital Champion in library in Blaenau Ffestiniog, or in a café where she set up a regular session after learning they had free WiFi, and talking to the owner who turned out to be very keen. “People don’t want to help in any old place — we’ve tried in a Costa but people didn’t want it there. It needs to be the right kind of place. The Lakeside café is off the beaten track, it’s next to a hydroelectric power station — power station workers come in, and locals on walks in the countryside [come in] before they go shopping. “It’s really rural where we live, a lot of small towns and villages – we have no big stores, no banks – it’s quite remote in some areas – so people want to be able to buy online, which is the only option for some of them. But they’re really worried about online banking – putting their details in. Elizabeth from south Gwynedd (right) met Rachel from Digital Gwynedd for a couple of sessions and found her attitude to a tablet given to her by her family transformed: she uses e-mail, Google, Skype, and takes a lot of pictures to share. While Rachel tends to help people who are older, the demographic group most people think of when we talk about digital exclusion, she also helps quite a lot of young people who are facing a variety of digital skills challenges. This is contrary to a commonly-held assumption that all young people are ‘digital natives’ and therefore don’t need basic digital skills support. Rachel works with younger people including those experiencing difficulties finding work and who need help to use the Department of Work and Pensions’ Universal Jobmatch system (a common requirement in order to receive unemployment benefits like Universal Credit), or who are looking for things to do when out of work and lacking opportunities to find a job. You don’t need to be a computer whizz to be a Digital Champion – instead the key requirements are that you enjoy being online yourself and have a passion to help others. Before working as a professional Digital Champion, Rachel had been giving very basic first steps digital help – she said that when her boss suggested she applied for the Digital Champion role, she felt it wasn’t anything too scary. It’s quite important to us at Citizens Online that you don’t need to be a computer whizz to be a Digital Champion – instead the key requirements are that you enjoy being online yourself and have a passion to help others. Of the sessions Rachel has run, 160 have been recorded on the Digital Champions Network. The grey-black heatmap on the map below shows Rachel has helped people from Pwllheli in the West to Bala in the East, but that most of these people she has supported live in Blaenau Ffestiniog, with concentrations also in Harlech, and Barmouth in the south of the county. Rachel’s 160 session records (which don’t cover all the people she helps, as interventions are often too short to collect data) account for 14% of the total of 1,168 sessions that have been recorded by the Digital Gwynedd project on the DCN since May 2016 – blue dots). These records relate to 129 unique individuals – purple dots, trained at 17 different locations – orange circles. To begin with, some people were apprehensive about the title “Digital Champion” – they thought it was about providing super-tech help, and they didn’t even know what ‘download’ and ‘app’ meant. Peter Roberts (left), a farmer in the rural Pwllheli area, had no broadband or mobile signal. Finding that more and more of the paperwork and regulations involved in modern farming were going online, he attended a digital session with Rachel at Pwllheli Library. For the few people who come to sessions who already have some basic digital skills but need some more in-depth training, Rachel is able to pass them onto colleagues or refer them to local courses – helped in Gwynedd by our ‘signposting site’ at digitalgwynedd.wales. Citizens Online supports Professional DCs at the Living Wage Foundation rate of pay (currently £8.75 per hour and £10.20 in London). Because Professional Digital Champions are an employed role, they are more expensive option than either Embedded or Volunteer Digital Champions, but in our experience their professional, knowledgeable, deployable basic digital skills provision and the flexibility they bring is an important part of any digital inclusion project. Ultimately we value the role and the people who choose to do it for a job – we think Digital Champions are awesome! You can learn more about being a Digital Champion – helping others understand the benefits of using the internet, and showing them how to do simple things online. We also provide information on working with Digital Champions, making sure they have the right training in the right place in order to support your communities in a variety of different ways. New digital inclusion partnership in Kent!